Passers by look at the fire ball ride as Ohio State Highway Patrol troopers stand guard Thursday at the Ohio State Fair in Columbus. The fair opened Thursday but its amusement rides remained closed after Tyler Jarrell, 18, was killed and seven other people were injured when the thrill ride broke apart and flung people into the air. Kiddie rides and other “low-impact” attractions were open Friday. COLUMBUS — Rides at the Ohio State Fair’s Kiddieland and some elsewhere in the amusement park reopened Friday with the OK of inspectors two days after the governor shut them all down following a thrill ride malfunction that killed a teen who had recently enlisted in the Marines. The 18-year-old man’s girlfriend was among seven other people who were injured when the Fire Ball flung riders — some still strapped in their seats — through the air Wednesday night. A few people on the midway were hit by debris. The ride’s Dutch manufacturer has told operators of the attraction at fairs and festivals worldwide to stop using it until more is learned about what caused the malfunction. Ohio Gov. John Kasich shut down all rides for new inspections after the accident. Agriculture Department spokesman Mark Bruce said Friday that 28 rides were cleared to resume operations Friday afternoon. Those reopened include the children’s carousel, bumper boats and other “low-impact” attractions including the Giant Slide and SkyGlider. More than half of the fair’s rides remained closed. It runs through Aug. 6 . Federal and state investigators have begun working to find what caused the wreck on the fair’s opening day. Tyler Jarrell, of Columbus, was thrown about 50 feet (15 meters) and pronounced dead on the midway. The Marine Corps and school officials said Jarrell enlisted last week and was to begin basic training after his high school graduation next year. Lennon said the teenager had been interested in going into the service or law enforcement for quite a while. The injured ranged in age from 14 to 42. At least two were listed in critical condition. Jarrell’s girlfriend, Keziah Lewis, doesn’t remember the accident and has pelvis, ankle and rib injuries, her mother told The Columbus Dispatch. Lewis, a University of Cincinnati student, underwent one surgery and faces a second. Inspectors looked over the ride while it was assembled and signed off on it hours before it flew apart, according to authorities and records released Thursday. The ride’s manufacturer, KMG, said the one at the Ohio fair was built in 1998. Forty-three of the rides, also known as the Afterburner, are in use around the world, 11 of them in the U.S., according to KMG. None has had a serious malfunction before, the company told the AP. The Fire Ball swings 24 riders back and forth like a pendulum 40 feet (12 meters) above the ground while they sit facing each other in four-seat carriages that spin at 13 revolutions a minute, according to the company’s website. 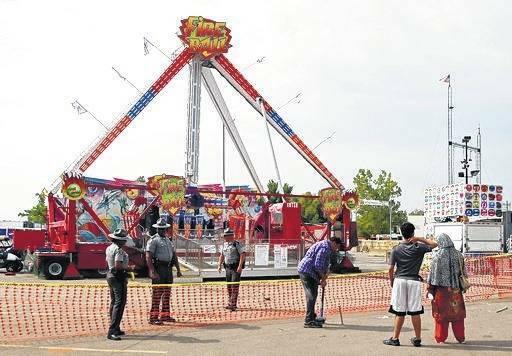 Michael Vartorella, Ohio’s chief inspector of amusement ride safety, said the Fire Ball was inspected three or four times before the fair opened. Amusements of America, the company that provides rides to the state fair, said its staff also had inspected the ride before it opened. It said there have been at least 22 fatalities associated with amusement attractions since 2010. The Ohio State Fair is one of the biggest state fairs in the U.S. It drew 900,000 people last year. AP writers John Seewer in Toledo, Ohio; Dan Sewell in Cincinnati; Mark Gillispie in Cleveland; Denise Lavoie in Boston; Mike Corder in Brussels, and news researcher Rhonda Shafner in New York contributed to this story.